This is what I’m paying thousands of dollars a year to eat. 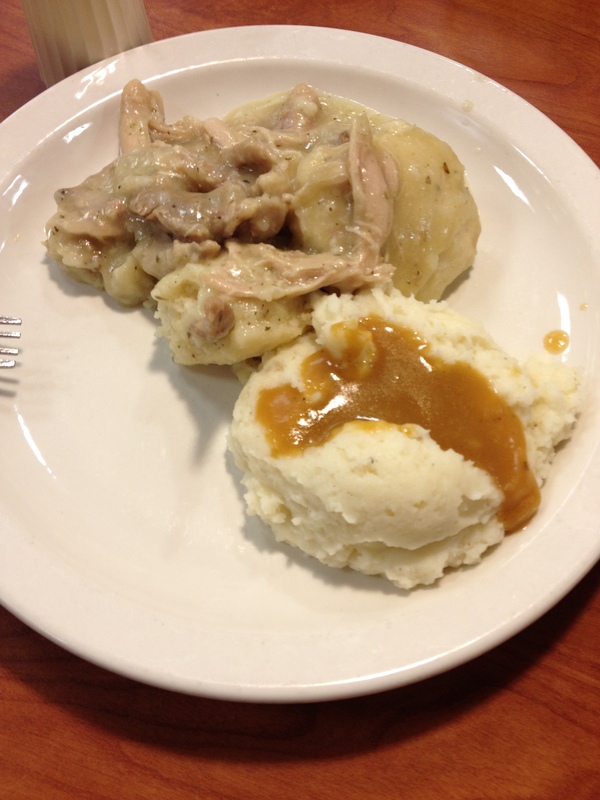 If I didn’t tell you it was chicken and dumplings, would you have been able to tell? Granted, it isn’t awful tasting but this whole meal is whiter than Justin Bieber. They had carrots seasoned with cayenne pepper that I passed on. It’s like the people who make up the menu have no taste buds. If you listen quietly, you can hear Julia Child weeping from heaven. This was the dessert that they served on white food day. 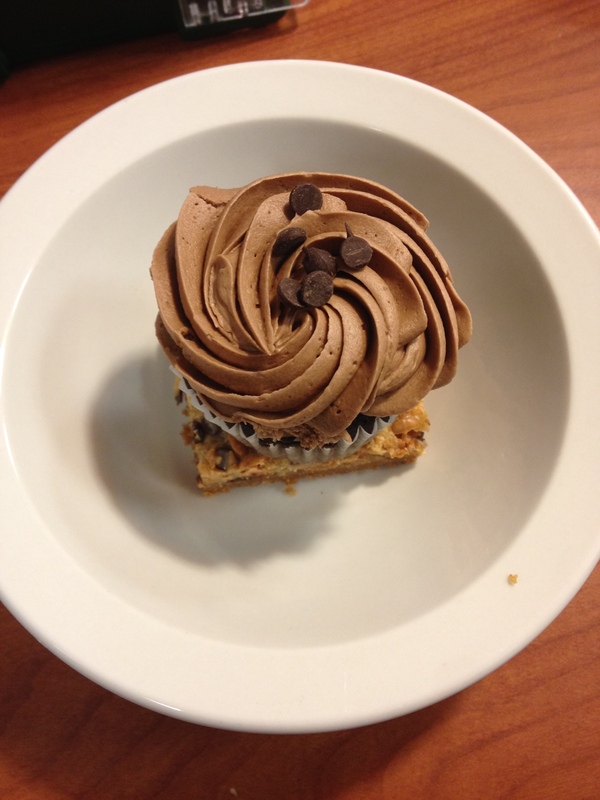 I got a cupcake and a blondie because I knew – chances are – one of them was going to be disgusting. I was right. The cupcake was so dry that I couldn’t even pretend to enjoy it, but the blondie had toffee and coconut in it and I was tempted to go up for a second one. I can only eat so much salad, but I made myself eat this yesterday because there was only tilapia with rice, enchilada filling minus the tortilla part, and stir fry that I eat all the time. All of it sounded sketchy especially the tilapia. Raise your hand if you trust yourself to eat fish served in the midwest (far from either coast where, you know, fish are typically caught) made by a crappy catering company. No one? That’s what I thought. The nachos sauce is made with real American cheese slices too! 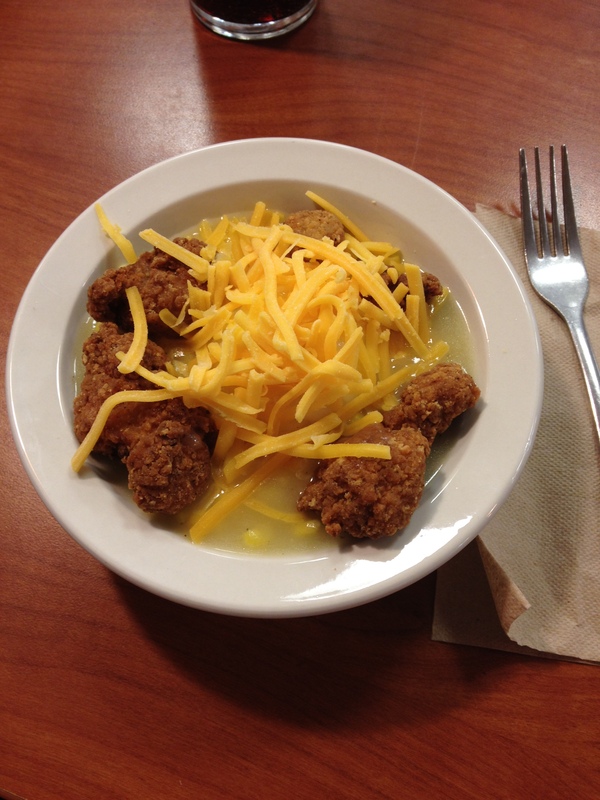 Chicken bowls are always the best part of everyone’s day. I think they’re served every other week and they’re basically KFC in a bowl. Mashed potatoes, chicken, gravy, corn, and cheese. Oh, and the water machine has been broken for over a week now. So our options are soda, lemonade, or chocolate or 2% milk with every meal. I’m pretty sure they’re trying to fatten us up for slaughter. That’s the only logical conclusion I can come to. Last night after eating cereal for dinner yet again I went to my room and bought 24 cans of V8 on Amazon in hopes that I can get more vitamins that way. I give up. It’s 1:30am at the moment. Who knows when I’ll actually get this posted, but there’s some video game tournament going on in the room next to me, so I’m wide awake. I don’t know if I enjoy posting the food that I consume here on a daily basis or if it just makes me sad. I’m thinking sad. 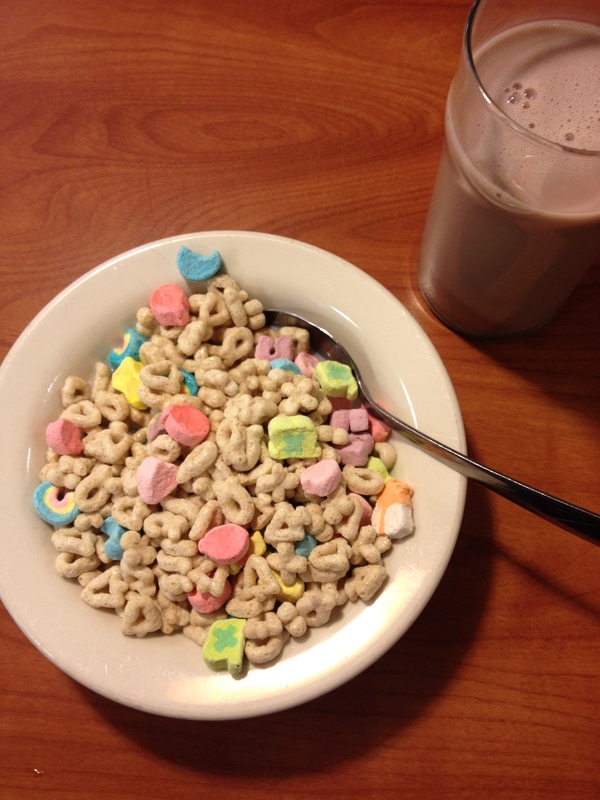 Lucky Charms and chocolate milk was my dinner on Monday night. I figured it was the healthiest option compared to the fried catfish in a mysterious brick shape, the chicken bruschetta pizza, or the baked stuffed pork chop weighing in at around 430 calories. And that’s without gravy. I wanted to attempt to eat well, so I went and got some fruit cocktail. “Fruit.” There are (allegedly) grapes, peaches, pineapple, pears, and cherries in there. The first person to correctly identify them all wins. 1. I need to get out of the house/dorm more. 2. I was half singing it all out loud and people were giving me weird looks. 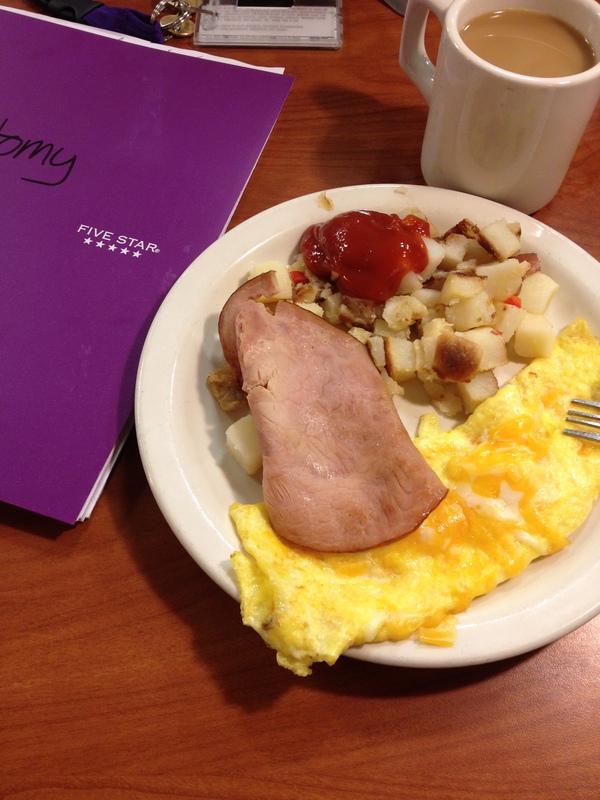 No matter how many times I tried to take a good picture of this, it only made the food look grosser. 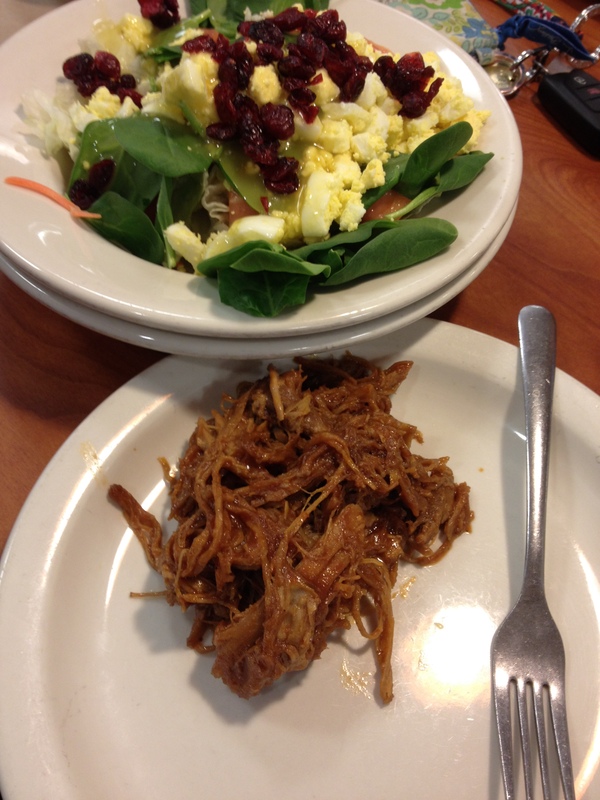 The pulled pork actually only had 190 calories, 1 gram of carbs, and 9 grams of protein. Why I passed up the Big Ole Chicken Burrito that contained 500 calories and 54 carbs is beyond me. And for the record, nothing in that song rhymes with epigastric, left hypochondriac, or inguinal region. Believe me. I already tried. My life is so hard sometimes. Except not really. Bad news #1. 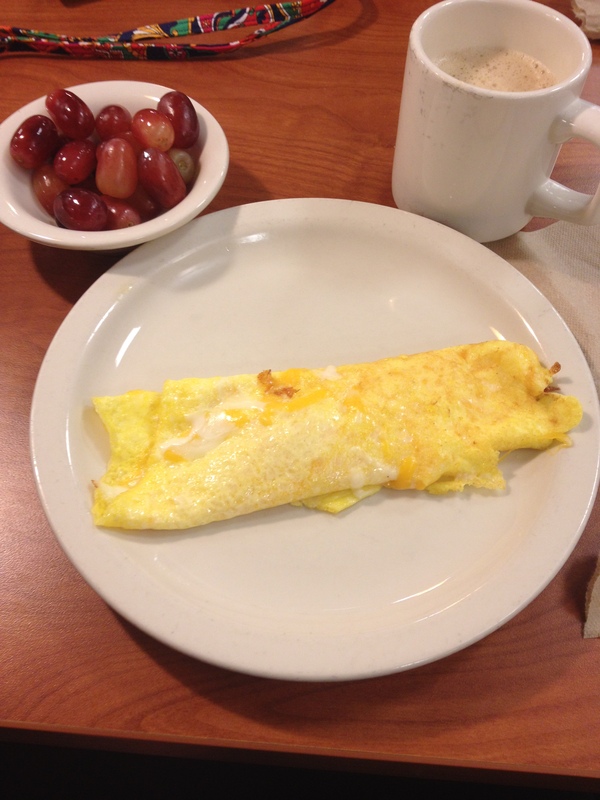 You know that omelet that I get at breakfast every morning because I assumed it was the healthiest thing on the menu? Wrong. It has 156% of the daily value for cholesterol. I don’t even know how to react to that except for have a heart attack. This morning at breakfast the choices were biscuits and gravy, heart disease in omelet form, scrambled eggs, and the always sketchy sausage patty. 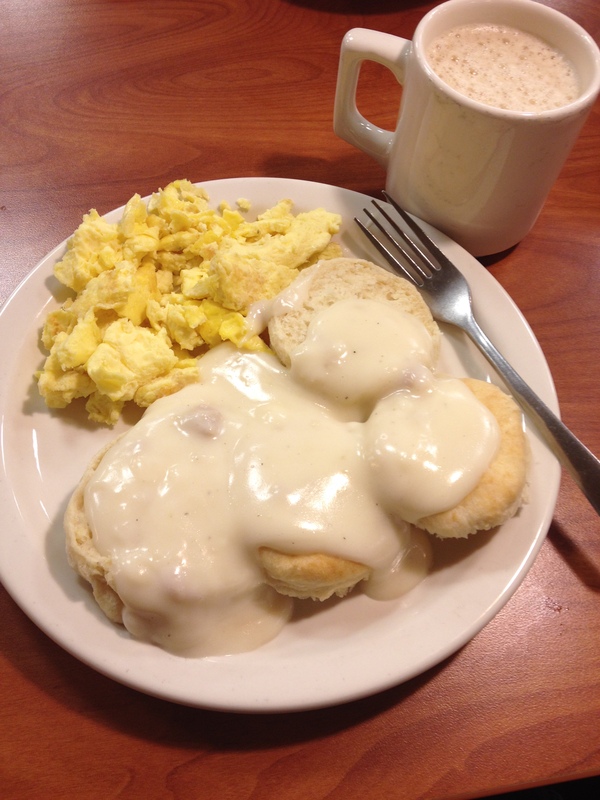 I picked the biscuits and gravy because wheat is nutritious, right? 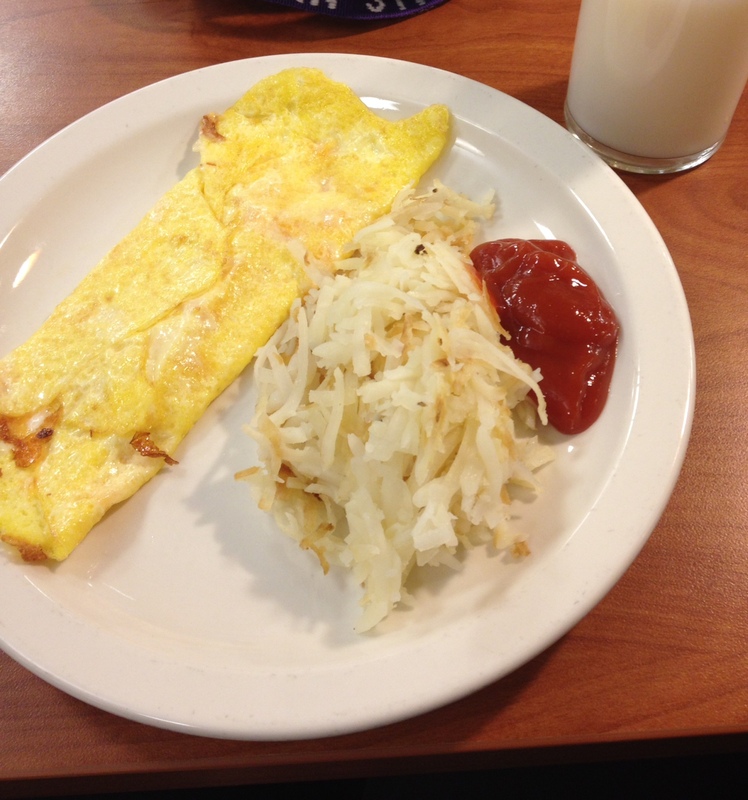 I went to breakfast with nine people. Only four talked during it and one guy fell asleep (of course we took pictures). We’re all quite happy the week is over. Bad news #2. One of my best friends here is transferring to another college. She wants to go into pharmacology and this place doesn’t have exactly what she’s looking for. I guess the plus side is that I’m going to be roommates in the fall with the girl she was originally going to room with, and I absolutely adore her. I’m sad to see her leave, but I think it’s all working out for the best. Bad news #3. I’m so out of shape. The health class my advisor signed me up for is titled Iron Lung. Yes, you may start laughing now. We had to do pushups, planks, wall sits, and crunches yesterday. Between that and the blisters I’m getting from breaking in my new Doc Martens, I’m in a lot of pain. Bad news #4. This was dinner. Again. Apparently the contract with this catering company is until 2016. I don’t plan on moving off campus because my dorm is right next to the health science building where I’ll have all my classes, so I’m stuck eating this food until I’m a senior. Bad news #5. At dinner I overheard one of the women serving food say to another woman “I don’t think any of the pizza crust cooked all the way.” I’ll just stick with salad. Happy 3rd birthday, Spoonlighting! 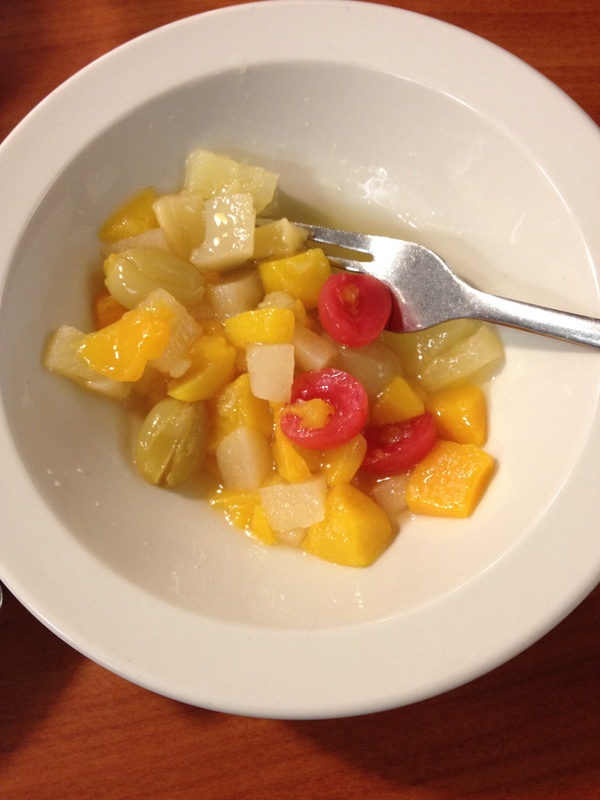 To celebrate, let’s look at what “food” they serve me at college. Oh hey, fun fact: the freshman 15 is a real thing. I went back home over break and tried on a pair of pants that I had left there and was completely convinced that they had somehow shrunk in the drawer. I’m trying to be more healthy this semester and cut back on soda and carbs. It’s pretty impossible to do that at my school without just eating salad all the live long day. So here are some of the things I’ve had since getting back. Some of the pictures are a little blurry because I have to sneak take them or I look like a weirdo obsessed with her food. Which I sort of am. 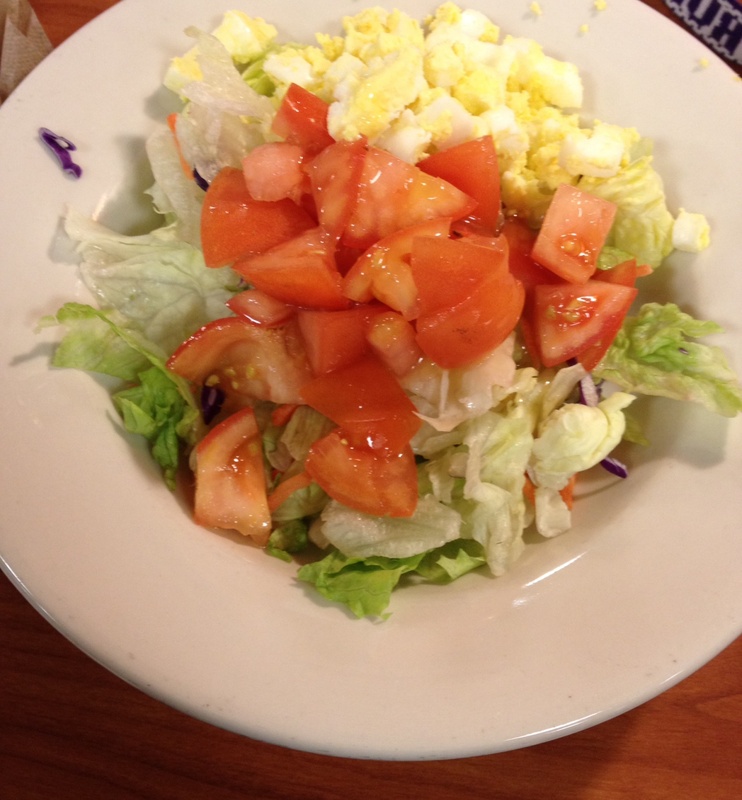 Salad with tomatoes, hard boiled eggs, and lite Italian dressing. I used ranch dressing last semester but I’m assuming this is better for you? 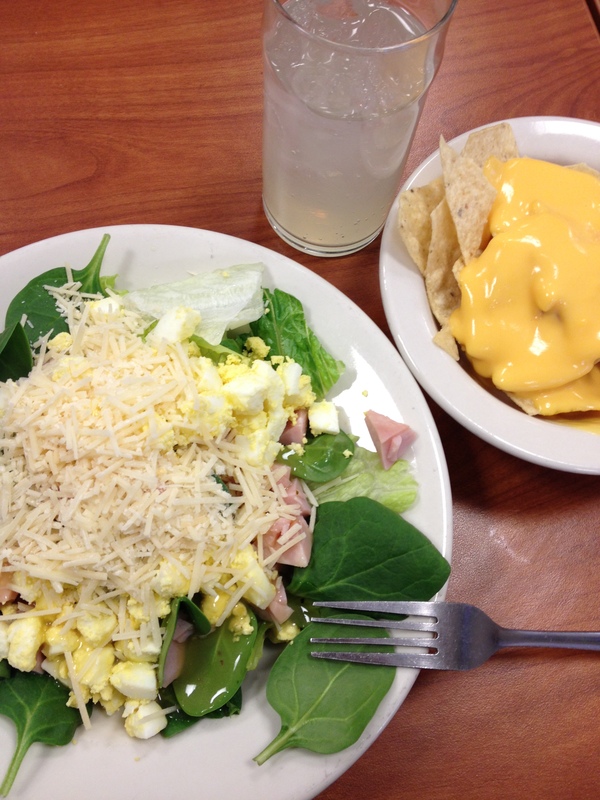 I was limited to salad that day because the only food they offered was a 900 calorie chicken and bacon wrap with the entire mayo factory on it, macaroni and cheese pizza, and chicken fried steak. Pasta with meat sauce. I tend to only eat meat from the dining halls when it’s ground up and I can’t see how gross it is. I got a diet Pepsi instead of water and also had an ice cream cone, because the soda and ice cream are the only consistently decent foods here. Well, except when they replaced the vanilla with banana ice cream. That was a very low two weeks for my school. THEY HAD CANNED PINEAPPLE. You have no idea how exciting that was to everyone. 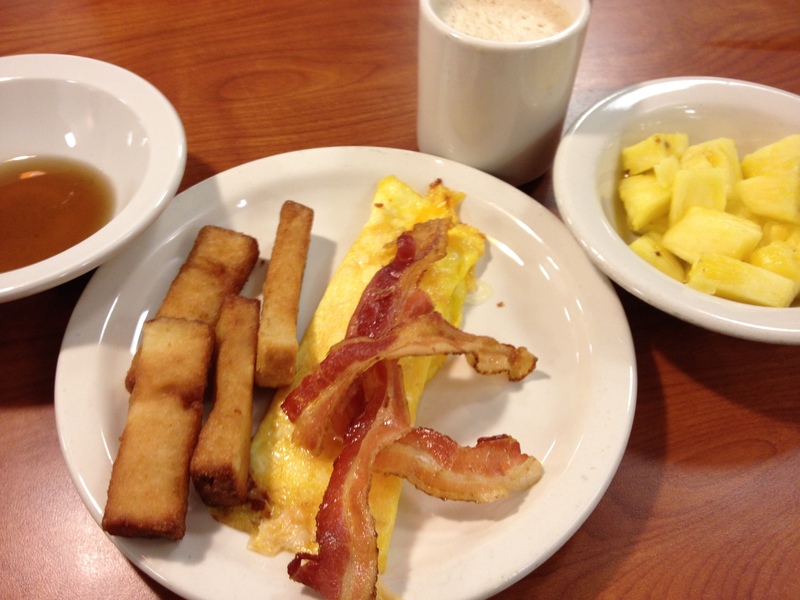 I also got French toast sticks that were pretty decent, bacon that was incredibly lacking in the flavor department, and, again, cheese omelet. And coffee because I can’t endure 8:30 classes four times a week without it. Stir fry that wasn’t too bad. 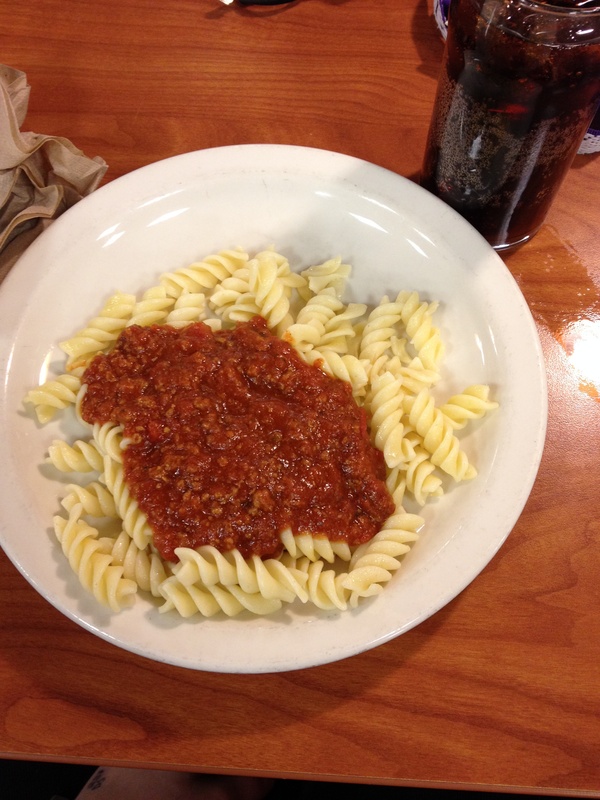 There was too much sauce and not enough veggies, but at least I didn’t feel guilty about not getting a salad. 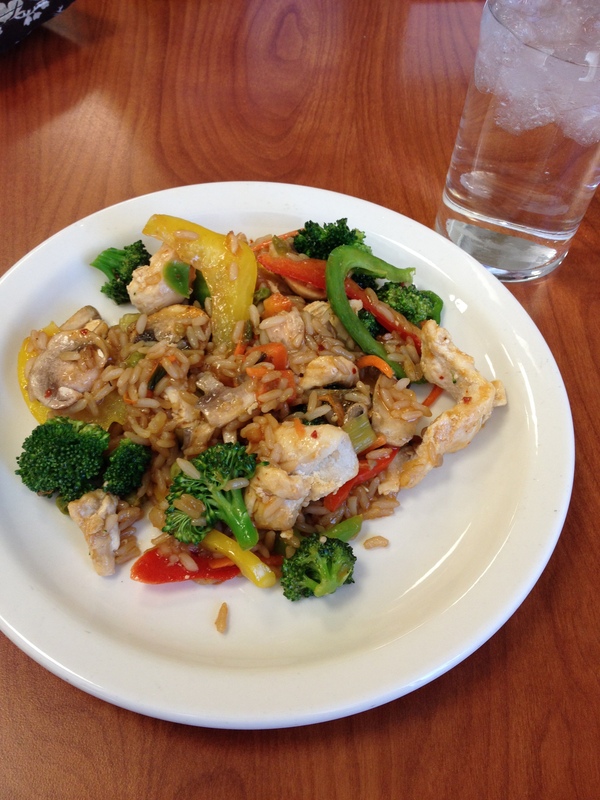 I passed on the deep-fried tofu and opted to put chicken in the stir fry instead. Last night for dinner my friend ordered a pizza, so I was saved from dining hall food. Skipping the biscuits and gravy, sketchy sausage patties, and corned beef hash, I had to stick with just a cheese omelet this morning. I ate a whole two grapes before I had to give up because they were so under ripe. But that coffee, though. 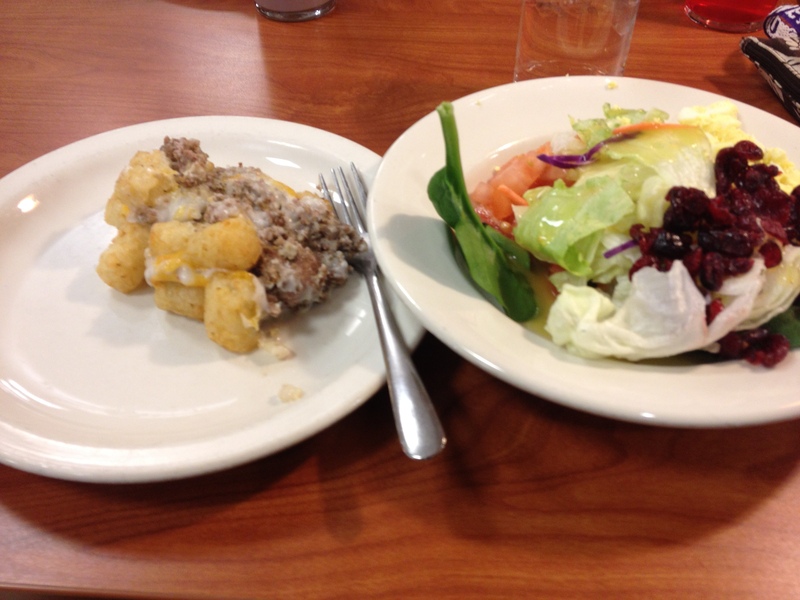 Incredibly blurry tater tot casserole and salad. I tried to justify the casserole because even though it had 320 calories and 22 grams of fat, it did have 16 grams of protein. 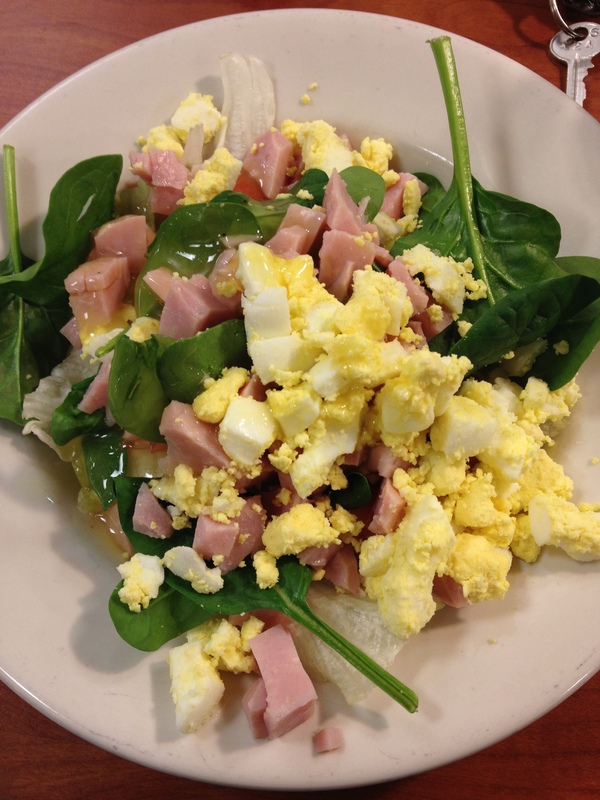 I added spinach to the salad which balanced it out? So basically I miss my mom’s cooking (or at least being able to easily cook in a kitchen) already. And I talked to my academic advisor today about adding a philosophy minor to my nursing major, so I’ll start philosophy classes in the fall. All it will entail is taking about 17 credits a semester and not going berzerk in general. I think I can do it.